You are here: Home / Blog / Random thoughts / Have I sold out? Book royalties are defined in the contract between the author and the publisher, and is only relevant between those two parties (note this differs from performance works, such as music, which often do have use based royalties). So under most (but not all) country’s laws, there are no royalties for selling used books. Also, when you give away or sell a used book, there is a physical transfer of the product, and thus there is no copyright issues either (since no “copy” was made). But when people sell or transfer “used” e-books there might be a copying of the work (unless prevented by the e-reader device — which some do if the work is copyrighted). Thus copyright law may apply. In the short term, maybe. But in the long term, depending on use, maybe not. I buy mostly used books (even have many from the 19th century). And these all have zero added environmental footprint. A 19th century book has not require any recharging in the past 100 years, nor did I have to purchase a new, or “upgrade”, a piece of electronic hardware to view them. The inscriptions in old books are amazing. I have one dated 1869, and the penmanship of the person who wrote it is simply incredible — a thing of beauty in its own way. I feel that reading on-screen is viable enough for those many readers who tend to skim through what they read. My own experience tells me that I can’t proofread my work properly on-screen, it has to be printed out and firmly eyeballed. Even though the two versions are literatim identical and both are by me, there is somehow a difference of perception. No, you have not sold out. Reading is what matters. In any form you can find. For the *good* free e-books see the Project Gutenberg. 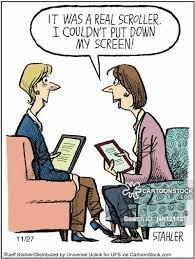 I started reading e-books waaaay back when Palm Pilots did not have WiFi or phone lines. I could not get books in Venezuela, and no libraries either. It was wonderful, pull out the Palm Pilot, and read in all of those long lines at the bank, at the Dr’s office. Project Gutenberg was/is an amazing source of books before Kindle and Amazon. I still have lots of books in my house, and I only read print books in the bath and at the beach. But e-books saved my sanity. I am hooked. Perhaps the pretty severe restrictions on luggage by airlines are a more serious threat to books than Kindle is. Well certainly choices as to what to bring when travelling are influenced by the rules airlines have on checked and cabin baggage. I like books on paper and it would be sad if they were to die out- however I doubt if electronic forms of reading will of themselves ever cause this. A slightly more serious issue : will the quality of what people read fall as more and more reading moves over to electronic form ? Publishing and disseminating both rubbish and quality writing is easier, faster and probably more economic with the aid of modern technologies. I have no hard evidence, but I think that the quality of what people choose to read will depend on many factors apart from just the form in which they access it. Mary, check out this link. It is me. 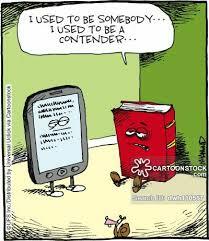 I am too attached to my Kindle.